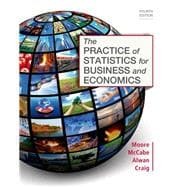 by Alwan, Layth C.; Craig, Bruce A.
George P. McCabe is the Associate Dean for Academic Affairs in the College of Science and a Professor of Statistics at Purdue University. In 1966, he received a B.S. degree in mathematics from Providence College, and in 1970 a Ph.D. in mathematical statistics from Columbia University. His entire professional career has been spent at Purdue with sabbaticals at Princeton, the Commonwealth Scientific and Industrial Research Organization in Melbourne (Australia); the University of Berne (Switzerland); the National Institute of Standards and Technology (Boulder, Colorado); and the National University of Ireland in Galway. Professor McCabe is an elected fellow of the American Association for the Advancement of Science and of the American Statistical Association; he was 1998 Chair of its section on Statistical Consulting. From 2008 to 2010, he served on the Institute of Medicine Committee on Nutrition Standards for the National School Lunch and Breakfast Programs. He has served on the editorial boards of several statistics journals, has consulted with many major corporations, and has testified as an expert witness on the use of statistics. Professor McCabe’s research has focused on applications of statistics. Much of his recent work has been on problems of nutrition, including nutrient requirements, calcium metabolism, and bone health. He is author or coauthor of more than 160 publications in many different journals. Bruce A. Craig is Professor of Statistics and Director of the Statistical Consulting Service at Purdue University. He received his B.S. in mathematics and economics from Washington University in St. Louis and his PhD in statistics from the University of Wisconsin–Madison. He is an active member of the American Statistical Association and was chair of its section on Statistical Consulting in 2009. He also is an active member of the Eastern North American Region of the International Biometrics Society and aws elected by the voting membership to the Regional Committee from 2003 to 2006. Professor Craig has served on the editorial board of several statistical journals and has been a member of several data and safety monitoring boards, including Purdue's IRB. Professor Craig's research interests focus on the development of novel statistical methodology to address research questions in the life sciences. Areas of current interest are protein structure determination, diagnostic testing, and animal abundance estimation. In 2005, he was named Purdue University Faculty Scholar.